Johnny Mercer is expected to ‘return’ to Tybee Island for one evening only next month as the beloved musician’s spirit, stories and recollections come to life once more thanks to Tybee resident Jim Wann. 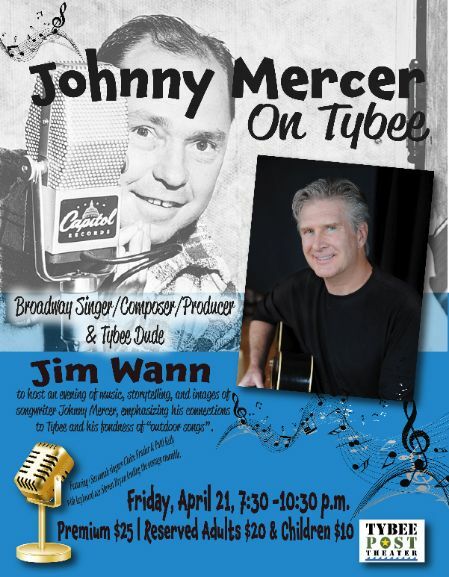 The Broadway actor/writer/producer will host “Johnny Mercer on Tybee,” an evening of music, storytelling and images of Mercer, emphasizing his connections to Tybee Island and his fondness for “outdoor” songs. The popular and successful songwriter, who was known to draw upon his Georgia heritage for inspiration and ideas, was born in Savannah but had well-established ties to Tybee. Legend has it that as a youth, Mercer could be found sneaking bootlegged liquor with his older brothers and cousins at Tybrisa, and attending dances on the beach. The original show is set for 7:30 p.m. Friday, April 21, 2017 at the Tybee Post Theater, which just received a new roof after Hurricane Matthew badly damaged the historic structure only a year after its extensive renovations and grand reopening. Featured singers in this special program include Savannah's own Claire Frazier and Patti Kelly, with various approaches to Mercer classics. Tybee's American Songbook keyboard ace Steven Bryan will lead the onstage ensemble, which includes Ryan Kelly on bass, Matt Fallin on drums, Larry Golden on sax, Bobby Hanson on harmonica, and Wann on guitar. In addition to the music and storytelling from sources who knew Mercer years ago, archival footage of Mercer on talk shows, variety shows and interviews will be shown. Wann, who lives on Tybee for part of each year, is a renowned composer, lyricist and performer who supports and participates in a number of Savannah musical organizations, including the American Traditions Competition and the Savannah Philharmonic. He has served as a judge and board member for the ATC, and in 2015, the Philharmonic performed one of Wann’s songs, “Christmas in Savannah” at the annual Holiday Pops concert. In New York, Wann’s professional feats include composing and performing Broadway and off-Broadway hits, such as “Pump Boys and Dinettes”; “Diamond Studs: The Life of Jesse James, A Saloon Musical”; “The People Vs. Mona”; and “King Mackerel & The Blues are Running.” "Pump Boys" was nominated for a Tony Award for Best Musical, 1982, and has since played across the country and around the world. A self-described Mercer fan for many years, Wann said he’s honored to present Georgia’s favorite son onstage, before many longtime Coastal Empire residents who personally knew and loved the famed songwriter. He'll read excerpts from books by Mercer friends and historians Julius "Boo" Hornstein (“Sites and Sounds of Savannah Jazz”) and Polly Wylly Cooper (“Tybee Days”). Archival video of Mercer’s TV appearances will be shown, courtesy of Friends Of Johnny Mercer. Reserved seating tickets to “Johnny Mercer on Tybee” cost $20 for adults. Premium seats cost $25 for adults, and children’s tickets are $10 each. In addition, special $10 student tickets will be available to attract young audience members. For more information on the show or to purchase tickets, please visit https://tybeeposttheater.showare.com/. For more information on musician and composer Jim Wann, please visit http://jimwann.com/.